But sometimes Finn follows Luke's steps in anh, right? A Rathar is an outverted Sarlacc, Finn get's entwined by the Rathar & Lando get's entwined by the Sarlacc ( A Rathar is a rolling Sarlacc) Nobody liked the Rathar scene, but I can see why Kasdan put it in. 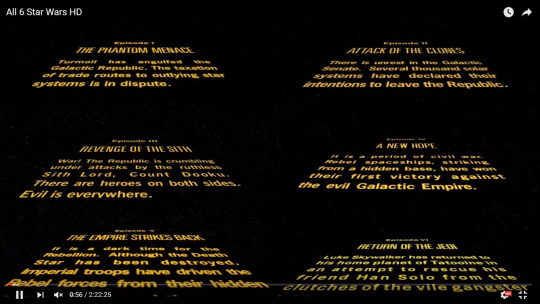 So next chapter should rhyme with taotc and nothing else? Finn even points to the MF first, because the MF was Lando's ship first. Finn takes Rey's hand 2x, Lando kisses Leia's hand 2x....in ESB ... Remember Lando is Kasdan's creation. @Maria Antonietta wrote: So next chapter should rhyme with taotc and nothing else? My guess is Reylo will rhyme with Anidala in AOTC, & Finntran should rhyme with Hanleia from ESB... just a guess we shall see. One thing that occurred to me the other day is that the first movie in each trilogy has the mentor confronting and getting killed by the villain, while the hero watches on helplessly and screams "No!" in shock and horror. 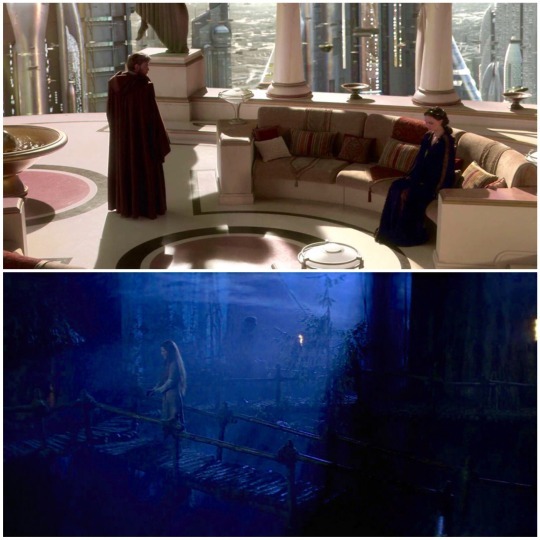 Prequel Trilogy: The Phantom Menace has Obi-Wan trapped behind a blast shield when Darth Maul kills Qui-Gon, Original Trilogy: A New Hope has Luke torn between wanting to escape and wanting to help Obi-Wan before he gets killed by Darth Vader and Sequel Trilogy: The Force Awakens has Rey high up on a balcony when Kylo Ren kills Han Solo. Revelations Before a Final Confrontation. In Revenge of the Sith, Obi-Wan reveals that Anakin has turned to the Dark Side, and Padme’s pregnancy is revealed to Obi-Wan. 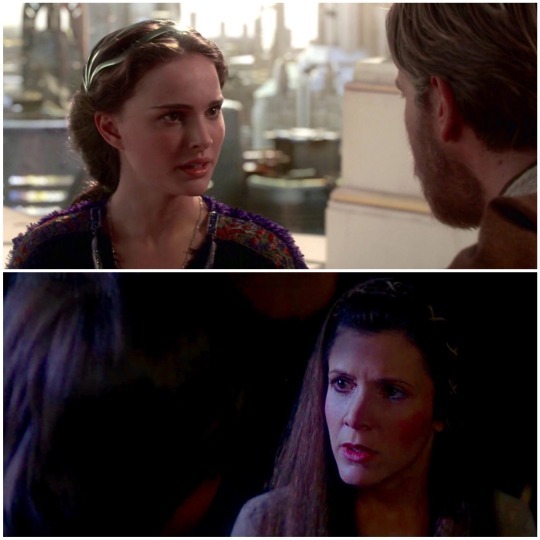 In Return of the Jedi, Luke reveals that he is Leia’s sister and that Darth Vader is their father. In addition, in Sith, Obi-Wan tells Padme he is leaving to kill Anakin. And in Jedi, Luke tells Leia he is leaving to save Anakin. @spacebaby45678 you are rocking this! @spacebaby45678 are we sure you're not kasdan's daughter? Yo you nailed it! Ring Comp, and your Maury moment, Who is your Daddy? 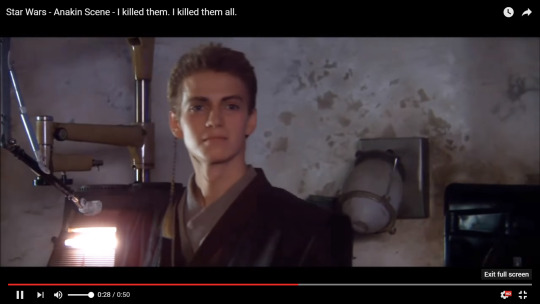 There has been lot's of theories that Darth Plagueis and may have created Anakin through the manipulation of midichlorians. I don't think that GL will ever tell the GA whether this theory is true or not, I believe that it is something that is meant to remain a mystery. 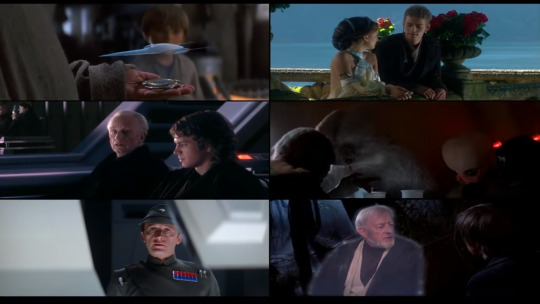 However, when you examine Ring Comp, the moment that Palps is telling Anakin about Plagueis and the manipulation of life, happens at the exact same run-time in ROTS as Obi Wan telling Luke about Anakin/Vader in ROTJ.... Ring Comp, is so deliberate that it becomes part of the narrative itself. @spacebaby45678 wrote: Ring Comp, and your Maury moment, Who is your Daddy? Qui Gon killed by Maul and Obi-wan upset. Han killed by Kylo and Rey upset (Finn present).... we've to remember that Luke was originally supposed to kill Han and it was changed. Rey/Finn gets killed by the antagonist and this will be witnessed by the next trilogy mentor. Well, if we keep it by pattern, then it will be Finn Calarissian who 30 years from now dies at the hands of a sith/darksider. @spacebaby45678 wrote: Well, if we keep it by pattern, then it will be Finn Calarissian who 30 years from now dies at the hands of a sith/darksider. 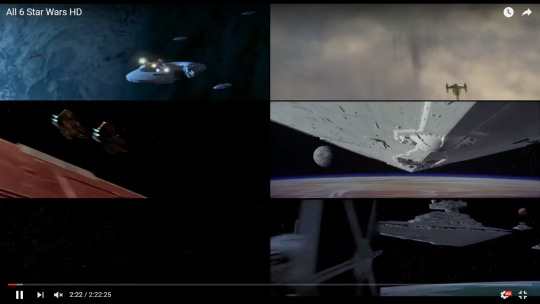 Everything is a Remix: The Force Awakens from Kirby Ferguson on Vimeo.